Mary Frometa, is the founder and singer of Mary's Band, musical group with over 15 years' artistic experience, who is not only the granddaughter of our remembered and famous musician "Billo Frometa", but a recognized singer of vocal talent, charisma, passion, elegance and professionalism, who has achieved a prominent position in music and on stage in various cities in Texas, as well as other states and internationally. Venezuelan daughter, born in Bryan, Texas and raised in Venezuela, Mary came to Houston, Texas where she initiated her professional career in the world of music in 1995. In 2000, Mary was invited by the Group "La Mafia" - repeatedly winners of the Grammy - to participate on their national tour "2000 Final tour". From then on, she decided to form her own band - Mary's Band - which she has led successfully, achieving great recognition and prestige in the community. According to Mary, the music world has opened up a multitude of wonderful opportunities of which she has managed to make the most. Grateful and proud, in 2001 Mary was hired by the company Anheuser-Bush, Budweiser as image/model of the beer and as a the BudLight Band for four consecutive years, representing such company in the states of Texas, Arkansas and Louisiana. The professional, social and personal experience was extraordinary and unforgettable, contributing greatly to her advances and development in social media and on stage. Together with her BudLight team, Mary enlivened for more than 10 years the special events of the Houston Dynamos and the Houston Astros. Through local entertainment agencies, had the honor of traveling in 2003 and 2004 to Japan and Korea, delighting with her music and Latin beat the American military bases in those countries. In 2009 she recorded her first album project which she called "Legacy" (Herencia), album dedicated as a tribute to her grandfather "Billo Frometa", in which she included tropical rhythms with which she identifies herself, such as the merengue, the salsa and the cumbia. 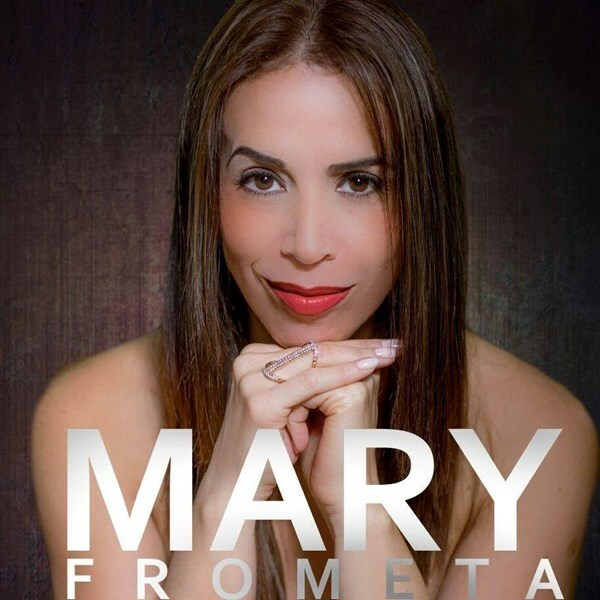 Thanks to her talented and extensive experience, in 2014, Mary was honored to be special guest on two consecutive occasions, to delight the audience at concerts with the Philharmonic Latin American Orchestra of Houston, scene of high renown that placed her overhead on her artistic career. Then, in early 2015, the outstanding Venezuelan producer, singer, arranger and composer "Mauricio Silva" invited our Mary Frometa to be part of his promising musical project LEGACY OF THE SALSA WORLD (El Legado de la Salsa Mundial), where Mary, along with other renowned artists, pay deserved tribute to the great of the salsa, including La Rumba Continua reminding "Celia Cruz Forever" (where Frometa participates with the musical theme: "Usted Abuso"), a homage to Jairo Varela (founder of the Group Niche), "Al Poeta de la Salsa" dedicated to the great Ruben Blades, among others. Since 2001, Mary has conquered her audience in a number of national and international festivals, of Christmas/New Year's celebrations, private/public presentations in premises of the highest level, thus becoming meritorious of an important reputation and clientele. Please note Mary Frometa & Mary's Band will also travel to Bellaire, Galena Park, Alief, North Houston, Missouri City, Pasadena, South Houston, Stafford, Humble, Sugar Land, Channelview, Pearland, Fresno, Deer Park, Katy, Spring, Cypress, Klien, Friendswood, Manvel, Thompsons, Barker, Highlands, Kingwood, La Porte, Webster, Crosby, Richmond, Porter, Rosharon.